To find Gonçalo Almeida, Giovanni di Domenico and Bálasz Pándi on the same stage seems something only one with great imagination could aspire. And that’s because this musicians combination is inherent in the crossing of creative music today, from drone, metal to freejazz. The result is a trio of individuality foreground, each with their own concepts, imagine goulash made out of fish would land on a pizza. “A promising wall of sound and adventurous creative music, that will make you glued to the floor, like you would be wearing cement shoes.” They will be presenting their debut album on Gaffer records. Balázs Pándi (born 6 August 1983) is a Hungarian drummer. He has worked and toured with various acts from all around the world including Venetian Snares, Otto von Schirach, Last Step, To Live and Shave in L.A., The Kilimanjaro Darkjazz Ensemble and Zu. He also played drums for the Blood of Heroes project. Balázs started an electronica-metal-breakcore project with Bong-Ra called Wormskull in 2010 (their first album “Sound of Hell” was released in 2011). Most recently he joined the Italian experimental instrumental band Zu. His current projects include Italian doom band Obake, Metallic Taste of Blood (featuring Colin Edwin of Porcupine Tree, Eraldo Bernocchi of Obake and Jamie Saft), and Slobber Pup (Saft, Joe Morris and Trevor Dunn). From 2012 he started to play solo shows on selected festivals under his own name. Giovanni Di Domenico, pianist, performer, composer, was born in Rome on the 20th July 1977, a significantly tempestuous period in socio-political terms, featuring hostile polarizations and an ostensive paramilitarism, mutinous ideological confrontations and bloody terrorist attacks, rendered infamous in the description ‘Years of Lead’. In that particularly caustic summer, the so-called ‘Movement of 1977’, non-aligned, without any ties to the Parliament and non-violent, broke into the scene of prevalent conspiracy-steeped paranoia condemning the repressive, discriminatory and authoritarian tendencies of the Italian State and demanding equality for minorities and further civil rights. The coinciding liberalization of the media market, putting an end to RAI’s monopoly, further defined this period as the prime moment for pirate radio, with the consequence of a libertarian fragmentation of youth culture, epitomised by punk. One could argue that Giovanni, self-taught until the age of 24, inherited – in philosophy, politics and artistically – the most benign and affirmative traits of that period, diversifying his action in the context of a recently unified Europe, promoting improbable connections, exploring varied geographies, comfortably manoeuvring aesthetical fringes and making a commitment to live performance at its most liberating and engaging. …. 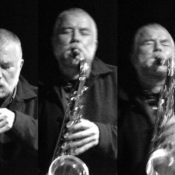 A distinction – one would call it generational – he shares with many of the musicians he has crossed paths with recently, artists as different as Chris Corsano, Jim O’Rourke, Akira Sakata, Tetuzi Akiyama, Keiji Haino, Eiko Ishibashi, Joe Talia, Okkyung Lee, Nate Wooley, Yan Jun, John Edwards, Darin Gray, Roger Turner, Steve Noble, DJ Sniff, Terrie Ex, David Maranha, Manuel Mota, Arve Henriksen, Norberto Lobo, Peter Jacquemyn, Alexandra Grimal, John Duncan, Tony Allen, Rafael Toral or Toshimaru Nakamura. Di Domenico has founded his own label, Silent Water, home of an eclectic and occasionally unclassifiable production. He lives in Brussels. Gonçalo Almeida born in 1978 Lisbon, Portugal. Lives in Rotterdam, Netherlands, where he followed studies at Rotterdams Conservatorium, having studied with Heyn van Geyn, Stefan Lievestro, Marius Beets and Peter Leerdman, finishing his master degree in 2008. 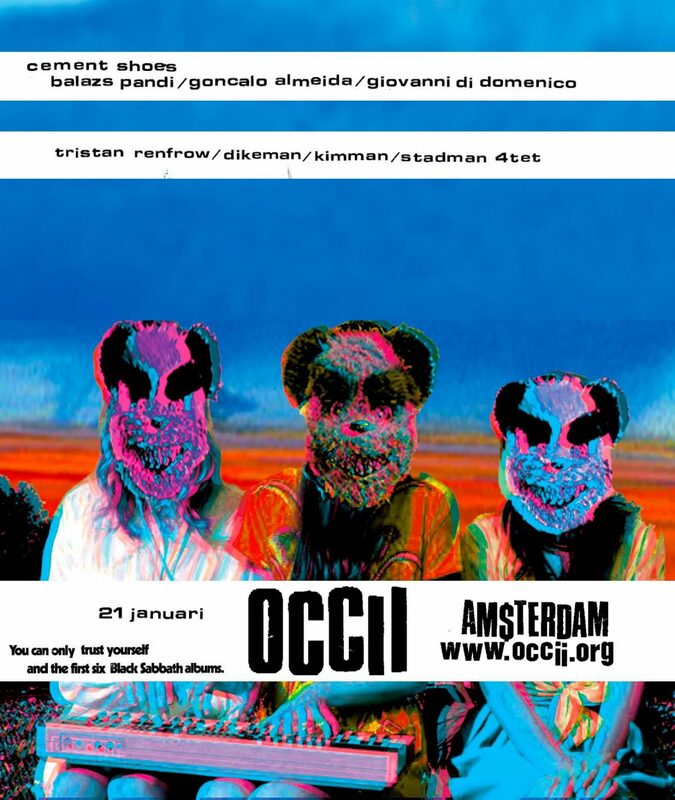 Plays in a variety of projects that go from modern jazz, freejazz, jazzcore and free improvisation music, having shared the stage with improvisers such has Ab Baars, Balasz Pandi, Chris Speed, Carlos Zíngaro, Fred Lonberg-Holm , Jasper Stadhouders, Jorrit Dijkstra, Martin van Duynhoven, Rodrigo Amado, Tobias Klein, , Wilbert de Joode, among others. Also has worked in collaboration with multi media such as video artists, modern dancers, poets and theater makers, worth to mention Arnold Dreyblatt, Julyen Hamilton, Rita Vilhena, etc. In the main projects that he is involved as double bass player, he has a deep input as a composer. Contraesthetica examines extreme rock music and complexity from a free jazz perspective. The stark and erratic shifts within their fast-paced sets mirror the flux of our stimulus-dependent minds in the 21st century.